No, not that sort of plaid. Rowan Plaid. In need of a bulky mitten pattern. Cast on 32 stitches onto 4 double-pointed needles (8 stitches on each needle). Join to work in the round. Begin knitting in 2x2 rib. Continue 2x2 rib for 2 inches. Next row: K14, place next 10 stitches on scrap piece of yarn. Cast on one new stitch over gap (using backward loop method) and continue to knit to end of round. (29 active stitches) Continue knitting hand portion of mitten until it reaches tip of pinky. Knit one round without decreases. Repeat decrease round. (20 stitches) Knit one more round without decreases. Repeat decrease round again. (16 stitches) Repeat decrease round twice more. (8 stitches) Pull yarn through remaining stitches, pull to close top of mitten. Move first two stitches of thumb gusset from scrap yarn onto first needle. Place next 4 on second needle and final 4 on third needle. With fourth needle pick up two stitches over gap and knit the two stitches from needle one. Continue to knit around (12 stitches on 3 needles) until only tip of thumb sticks out of thumbhole. Knit one round without decreases. Repeat decrease round. (6 stitches) Pull yarn through remaining stitches, pull to close top of thumb. 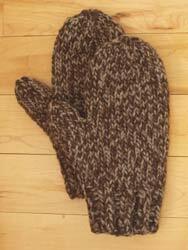 Weave in ends and enjoy your warm "plaid" mittens! You want flip-top mittens?? See Megan's alterations to this pattern! You know what would go great with these mittens? A Plaid neckwarmer. One ball should do. Cast on 60 stitches instead of 85 and follow pattern as written.